Here it is, the easiest filling of all… NUTELLA! Plain, simple Nutella. Just put 1 teaspoon in the middle of the cookie before folding into a triangle. Couldn’t be simpler, and it’s so yummy! 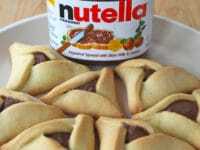 I made about 80 Hamantaschen last week, and the Nutella ones disappeared before all the others. Nutella is a dairy product, so don’t serve it with a meat meal if you’re worried about keeping kosher. 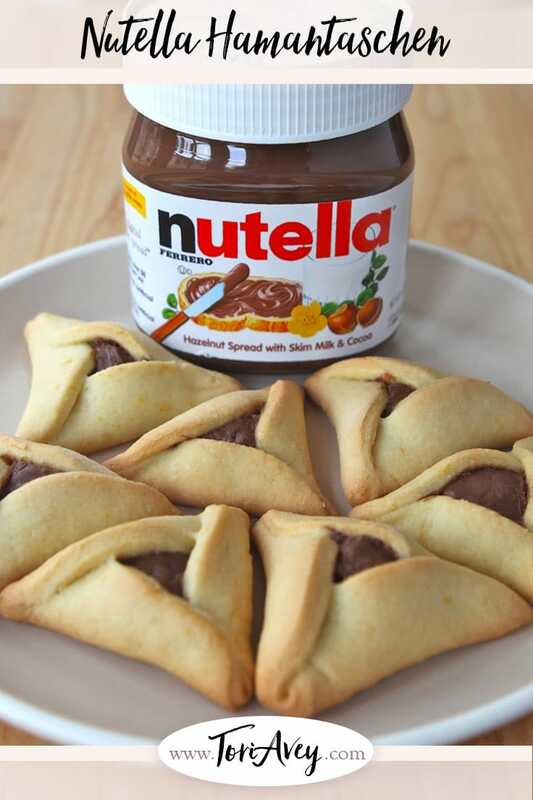 Nutella Hamantaschen are always a big hit with my family. The chocolate-hazelnut flavor is especially popular with kids. For my Dairy Free Hamantaschen dough, click here. For my Buttery Hamantaschen dough, click here. 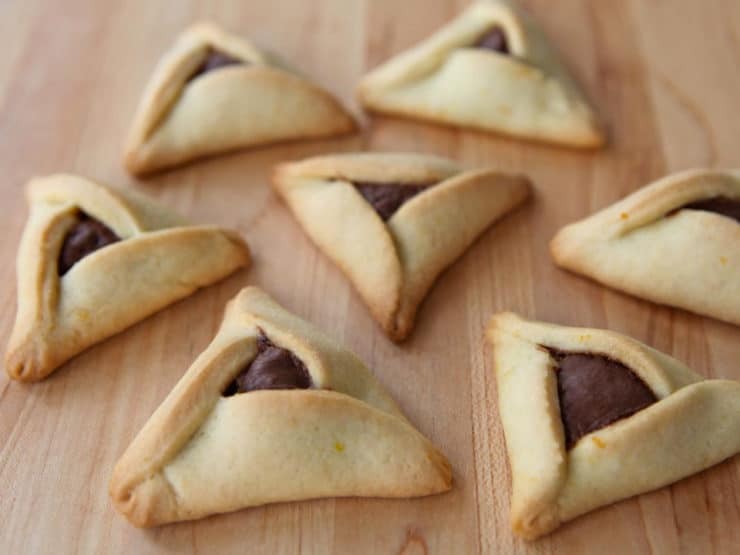 Other filling recipes can be found in the Purim Recipe section of my website. Thanks for your recipes. Looking forward to the Nutella filling. My question for you; can Apricot jam or preserves for filling be used? It makes using this for fillings so much quicker. I do not recommend jam, it tends to run– you need something thicker for filling. Use the recipe suggested for best results. made your non dairy hammantaschen this year for the first time. turned out fabulous. my new go to hammantaschen recipe. Hamantaschen are my favorite. I have to make tons of them because all my neighbors love them. Can’t wait to try your recipes. Thanks for sharing them with us. And click “like.” You should also hover over the button after you click like, and select “Show in news feed.” Then you should receive updates in your news feed. I will subscribe you to the website using the email you provided. Thanks for reading! how beautiful your blog is! It’s hard not to pin it all! 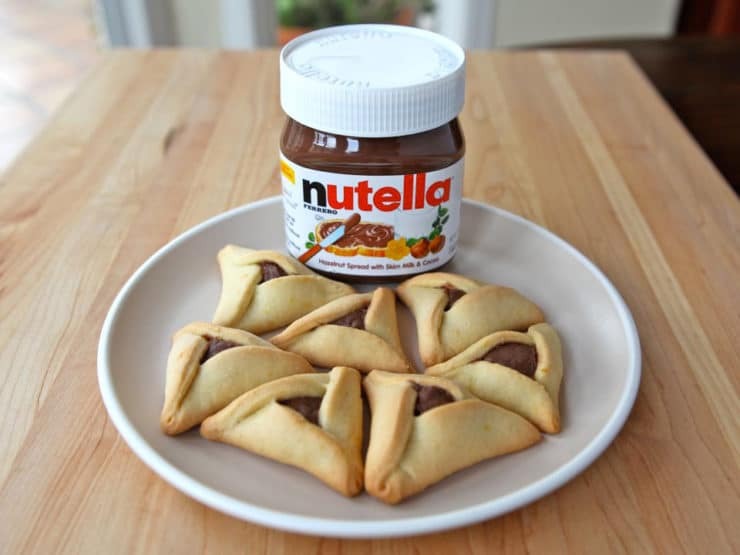 Hi…I’m a baker & a cooker & a Jewish maidel…I checked online to see if Nutella would work as A filling for Hamantaschen, or if I’d need to add stuff to get it right, as with many fruit fillings….I’m slated to give a Demo, next month. I’ve put together a simple dough & find Nutella, directly from the jar is the easiest & best filling I’ve ever used, in 50 years of making them.. Works way better than most fruit fillings that need doctoring so they don’t run all over the place. Thanks Bunches.Dotty R.
Hi Tori, been following your blog and doing a couple of recipes, but this one really made me laugh. Keep up the good work! I’m Jewish housewife, but I’m learning a lot from you! Ha! Thanks Kayla. 🙂 It’s so simple, I was debating even making it into a blog– but for those who haven’t thought to use Nutella, it’s a really helpful tip. Such a simple filling, and so yummy! Just wanted to say “hi”. LOVE your website and blog!! I found you on Facebook and became a fan and I love your whole “schtick” – the look, the feel, the info – so fun! Thank you from one shiksa to another, my nice Jewish boy will love me learning even more tips and tricks to great Jewish cooking. Can’t wait to see what you have for Passover coming up. I’ve been cooking all the Jewish food my hubby’s mom taught me since we got married (7 yrs. ago), but I think I’m ready to start mixing it up a little bit too. Anyway, just wanted to say hi! You’re a doll.